A Muslim person has no hope of winning the presidency in Lebanon due to a requirement that the executive leader be a member of the Maronite Christian Church. Such a rule might seem extreme from the perspective of religious freedom, but Lebanon is not alone. 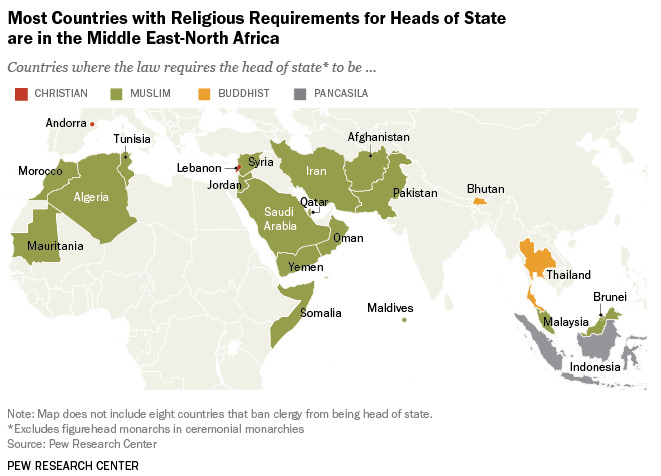 Thirty countries, or roughly 15 percent of the world's nations, require their heads of state to follow a particular religion, according to a new Pew Research analysis. These include both monarchies and republics, 17 Muslim countries, two Christian, two Buddhist and one Pancasila (the political philosophy of Indonesia.) The remaining eight prohibit clergy from running for office. 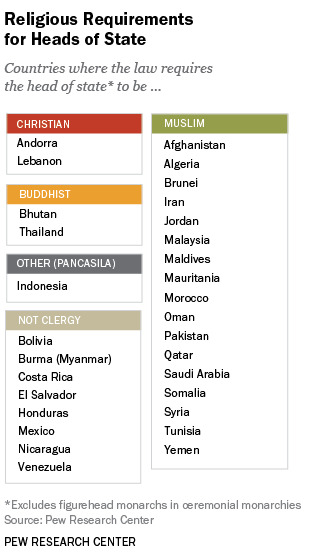 Several of the countries, including Iran, Saudia Arabia, Syria and Afghanistan, also made the State Department's 2012 report on international religious freedom as some of the worst perpetrators of religious oppression. In Saudia Arabia for instance, not only is the president's religion restricted, but any public practice of a religion other than Islam is prohibited. Pew also notes that 19 additional countries require a particular religious affiliation for ceremonial monarchs, including 16 countries that are part of the Commonwealth of Nations under Queen Elizabeth II -- who is referred to as the Defender of the Faith and belongs to the Church of England.